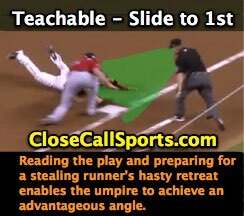 Let's take a look at some wonderful umpiring in this edition of Tmac's Teachable Moments. 1B Umpire Mike Muchlinski had a close play. During Saturday's Nationals-Marlins game, with one out and a runner on first base, the batter prepared for a 3-2 pitch. As 1B Umpire Mike Muchlinski will demonstrate, knowing situations is a great way to become a better umpire. This count is a potential steal play at 2nd but one thing we usually are not expecting with a runner going is a whacker back into 1st. This is where the play is a picture perfect example of how being prepared leads to excellent umpiring. I want you to watch this play in full speed...Looks out, doesn't he? Now watch it in slow motion. 1B Umpire Muchlinski is waiting for the play, sees there's no tag, and verbalizes it. Despite a bit of resistance and a good sell by the first baseman, you can feel the confidence oozing from Muchlinski. Let's analyze positioning. If the umpire moves just one step to his left, he's screened. If he's a step to the right, he may be able to see, but he'll be run into but the sliding baserunner. If he's two steps in either direction, he has literally no chance of seeing the play and will be guessing. Muchlinski's positioning enables a closer look. This is why we call it a keyhole: the window here is tiny. Muchlinski not only has the glove coming toward him (a goal to getting the play right), but a clear view of all the necessities (glove/base/ runners hand). There is something else that makes the play more complicated. When a glove hits the ground what happens? You get that arm break (not literally) that is a clue that fielder touched the runner. That's why the position is important: because sometimes the play is not what it seems. In a three-person umpiring position, the 1st base umpire would be in the same spot, but what about in a crew of two? If you were watching this in two-person, we'd likely have an out. The glove is going away from us and we'd be observing the play from the middle of the diamond. Also, the runner looks out and the first baseman sells the play well. There's nothing wrong with missing this play in two-person. Let's give credit where it's due. The umpiring this season in MLB has been outstanding the bar has been raised and continues to be thanks to great umpiring like we see here! Happy Umpiring! !